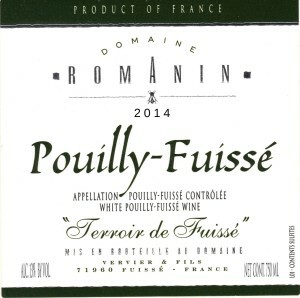 The Domaine Romanin is located in Fuissé, at the very heart of Pouilly-Fuissé and has about 11 hectares of vines. Winemakers (and grape-growers) for 5 generations, the philosophy of the Domaine is to cultivate and produce wines that are truly expressive of the terroir and to exploit the richness of the Chardonnay grape in the purest respect for tradition. Both Of Denis’s parents came from winemaking families, so when they married and united their respective domaine this was a huge plus and boost for Domaine Romanin, and it doubled in size from 4 to 8 hectares. Farming using sustainable methods or following the French “lutte raisonnée” which consists of strictly limiting treatment in the vineyards (5 to 6 times maximum throughout the year and less if we can) and using only natural substances like sulfur and copper. Mechanical weeding ou grass-growing between vine: The winery allows grass to grow between the vines to encourage healthy soil and limit erosion, another advantage of this is that it results in less dense vegetation and limits disease.